Link Parties are a great way to get noticed whether you are a new or established blogger. You can get your newest content out to a wide audience quickly. But how can you stand out among the hundreds of other similar links??? Make sure you have an eye catching square image - that looks great even as a small thumbnail. Yes we all want gorgeous vertical images for Pinterest but those images need to be cropped for link parties. Make sure your font is bold enough to be seen and your image isn't so detailed that it's blurry when shrunk down. For most link parties it's important to show up early! I know for some large link parties people are just waiting on the server for it to go live and 4 minutes later there are already 96 link ups! So find out at what time it starts and jump in line. One of my favourite link parties doesn`t have a set time it starts at, so I made sure I signed up to receive the weekly e-mail as soon as it goes live. A few link parties run in ascending order though so the newest links are posted at the top but this isn`t the norm. A simple trick that I have applied is to always tweet my link and make sure I add the hosts twitter name at the end @linkhost or hashtag the link party name (if there is one) This gets your tweet noticed, reposted and favourited. Also you will always stand out if you leave a comment. Even a thank you for hosting with a short genuine message will get you noticed. Link parties will have 300 links and only 6 comments. I find it`s sometimes difficult to determine how many views are derived from a specific link party because it doesn't take into account how many views you may receive from social media. For instance some hosts have a Pinterest board dedicated to their link parties, or they may only pin their favourites. Some of my favourite link parties are ``Pin It`` parties where everyone is required to pin a few of their favourites or the ones before yours this way you know you will be getting at least a few pins, which could get you hundreds of views if posted by the right person. 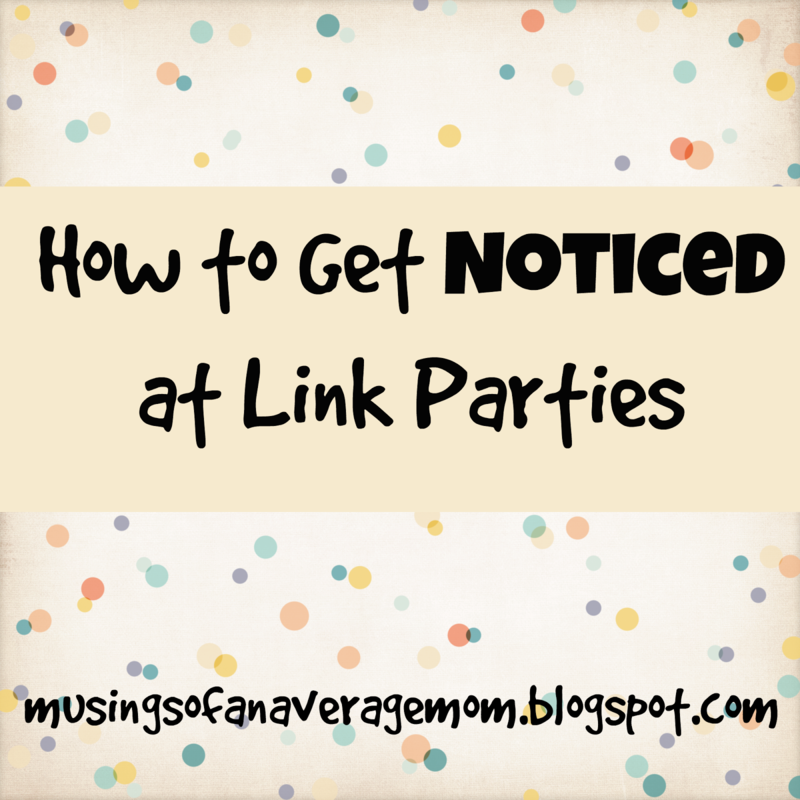 Did you have any other tips for getting noticed at link parties ??? Would love to hear them. I never thought to add the hosts name to the linky party tweets! Thanks for linking up to the Bloggers Brags Pinterest Party. I have pinned your post to the Bloggers Brags Pinterest Board. Interaction is a BIG part of getting noticed! I've made some great connections with other bloggers not by just reading their posts, but commenting on them as well. I usually use the #linkup hashtag on Twitter in addition to whatever hashtag the link party hosts have chosen for their party. I also thank the host I linked up through. My only worry is that my Twitter is starting to get taken over by link parties! Great post! You do get noticed when you do those things! Your post will be featured on Monday's Bloggers Brags Pinterest Party. Thanks for visiting and thanks for featuring me on the Bloggers Brags Pinterest Party! This is great! I have found that when you visit other links from the party and leave a meaningful comment that the blogger is more likely to return the favor. It is also how I have found some great blogs! visiting from frugal friday linky....good tips! I do them all. I have also gotten alot of great recipes from linky parties! Just seeing the picture makes me want to make the dish...so having a good picture to see the item being talked about is a big plus to me...if it doesn't look good, odds are, not many will visit! Thanks for visiting - and yes pictures are so important! I always get hungry visiting link parties and Pinterest lol. Hey! I found you at Frugal Friday. I loved this post, I'm fairly new to link ups. Thanks! I found you through Frugal Friday link party and I'm so glad I did! I'm enjoying taking a peek around your blog. Thank you for the tips! Visiting from http://www.andieconn.com/fad-going-gluten-free-reduced-depression-symptoms/ and would love a visit back. Thanks for the great tips! I am just getting started participating in link parties. I am basically just doing an experiment to see if participating in them regularly will boost my traffic. If it does, I want to eventually pay a VA to do link parties for me. Thanks for the tips! I had no idea there was a master list floating around out there, I've just been lucky enough to stumble upon a few I really like ;) And I'm always jealous of those speedy people at the top, so I try to give the late posters some love too. Thanks for the tips, I'm super new to these Link Parties and am needing to learn the ropes! Thanks!! Thanks for these great tips!!! Thanks for the tips and the list of linky parties I will have to see about adding some more to my line up. Thanks for the tips! I fairly new at link parties. I love the link parties that have the time right on their image. It's hard to figure out when they start and some start the night before. Great tips! I try to get to them as early as I can. But I work the evenings and some start right before I get home. And like you said, within minutes there are a hundred links. But since it's Spring Break, I will be home in the evenings and ready to link up fast! Posts link up even faster when there are multiple hosts/co-hosts. The "tweet it" tip is fantastic. Love the tips. Thank you! I knew I did something wrong! Great information! thanks so much! I host the Wonderful Wednesday Blog Hop plus the Growing Circles Hop and I can say that the biggest way to get my attention is to TWEET my party so that I get notified. Oh how I appreciate tweets. I always go to the tweeter's page and retweet something if theirs. Number 2 fave would be for you to leave a message that lets me know what you shared...either by the number of the link or the title. It gives me incentive to find your post. We get 400-500+ entries for the Wednesday party so it is too hard for me to look for a commenter's post if they don't give me a little direction. NEWBIES get special attention if they comment telling us that they are new and the name or URL of their blog. We've been known to all go over and like, follow, comment. We treat her like a princess! Thanks for your tips. I have read almost all the posts you have on blogging. Thanks for the tips! I usually try to link up right away and that does make a big difference. Found you from Meetup Monday! These are great ideas. I am a new blogger and have tried many link parties but often don't get very many blog visit from the parties. I'm going to try some of these ideas to see if I get more hits. Thanks! I always take the time to tweet and leave a comment after linking up. I figure it is the least I can do to express my gratitude to the host. Thanks for taking the time to share your knowledge with us. I really appreciate it.